Cascade Crescendo recorded their first studio album, “Caught In The Rain” in the Spring of 2016 at The Hallowed Halls in Portland, OR. The album features fiddle player, Allie Kral (Yonder Mountain String Band) on five tracks and a guest appearance by drummer Nick Werth (Yak Attack, Ghost-Note). The album is “an impressive debut for this young band and one that leaves you wondering what they will be capable of as the continue to grow as musicians” – Glide Magazine (2016). Cascade Crescendo rode the success of their new album, quickly winning over fans across the Pacific Northwest and around the country. They have been regulars at the Northwest String Summit and often team up with national touring bands including Hot Buttered Rum, Reckless Kelly, Henhouse Prowlers, Trout Steak Revival, Horseshoes & Hand Grenades, Kitchen Dwellers, Front Country, Vince Herman, Danny Barnes, and more at venues including the Crystal Ballroom, Aladdin Theater, Star Theater, and Doug Fir Lounge in Portland, and Seattle’s Nectar Lounge. In early 2018, Cascade Crescendo recorded their sophomore album at B-Side Studios in Portland. 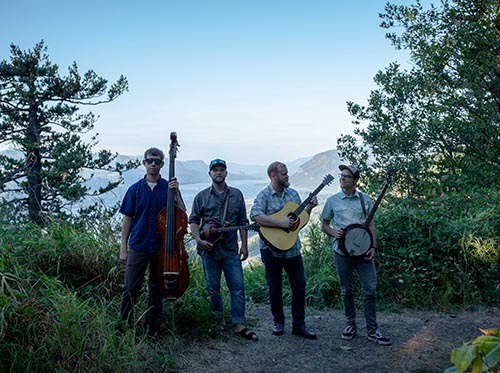 Entitled, “Chasing The Sun”, this album features return guest performances from Allie Kral (fiddle, yonder mountain string band) and Nick Werth (drummer, Yak Attack), as well as an appearance from Greensky Bluegrass’ Anders Beck (dobro).